Algiers is dressed for an election: In the towering natural amphitheatre that surrounds the Algerian port capital, six presidential candidates prepare to do battle. They include two nationalists, two moderate Islamists and a woman veteran left-winger. But take a closer look at the billboards surrounding the ancient Kasbah and one might be forgiven for thinking that only one man is running in Thursday's national election. 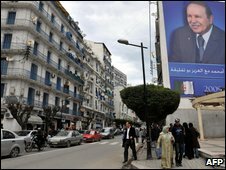 It is the face of 72-year-old incumbent President Abdelaziz Bouteflika that adorns every available space. He is bidding for his third term in office. He promises "continuity". "I can only see myself as existing within national reconciliation and national unity," he says. 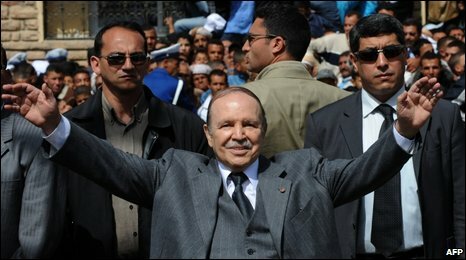 In November, the Algerian parliament rubberstamped an amendment that would change the constitution, meaning Mr Bouteflika can now run an unlimited number of times - virtually making him president for life. The main opposition groups are boycotting the poll in disgust. For Algerians at large the result is hardly in question. They know the contest is predetermined by the power of the state - the ruling party, the intelligence services and the army. The only remaining suspense when the result finally comes on Friday is how many will have turned out to vote. There is great apathy sweeping across this country, particularly among the young. 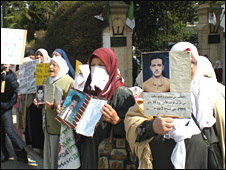 Seventy per cent of Algeria's population is below the age of 30. Despite the economic hardships they face, this is a country like so many others in the Arab world, where the focus rests on the struggle between the governing party trying to stay in power and the Islamists trying to take it. The political stagnation combined with high unemployment, rampant corruption and chronic poverty is a dangerous cocktail. There is widespread resentment at what Algerians call "la hogra" (contempt) - the brutal disregard for citizens exhibited by officials at all levels of government. 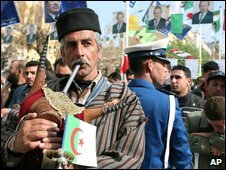 Yet under the stewardship of President Bouteflika, Algeria has regained some stability. Despite the residual violence that regularly flares outside the capital, this country is no longer the international pariah it once was. During the civil war of the mid-1990s the country was synonymous with some horrendous bloodshed. More than 100,000 people died in several years of bitter civil war between the security forces and the Islamic radicals. But since then Mr Bouteflika has presided over a period of relative economic growth. His international diplomacy has delivered new foreign investment in oil and gas, giving hope to millions of Algerians - even the moderate Islamists. In this election campaign he has promised $150bn (£100bn) of investment over five years, to create three million jobs in a bid to tackle youth unemployment. Some say he is for the moment the only realistic choice for change - but others say it is his plan for peace that stands in the way of any real progress. For the families of those who were "disappeared" during the 1990s, (over 10,000 families are still searching answers) the president's "charter for peace and national reconciliation" has become the charter of collective amnesia. Most crimes have never been investigated. The amnesty granted to Islamists and state-armed militias who dragged people away in the night has deprived grieving families of their right to truth, justice and reparation for their losses. And the legislation introduced in 2006 effectively muzzles those critical of the authorities' conduct during the conflict, threatening those who dare to speak out with prison terms of up to five years. The resentment festers. Critics say frustration is playing into the hands of the extremists. The offshoots of the Islamist radical groups that waged war during the 1990s are now affiliated to al-Qaeda in the Islamic Maghreb; the group that claimed credit for suicide car bomb attacks on the UN in December 2006. The jihadis are hunted across mountains and valleys east of Algiers, but they still pose a significant threat. There have been at least 20 incidents this year in which security personnel have died. Rumours circulate that of 3,000 prisoners granted amnesty in the past six months many have since returned to resume battle. More than 150,000 policemen have been deployed this week to ensure the security of the elections. Some believe it is the president's refusal to allow a return to politics by the leaders of the now defunct Islamic Salvation Front (FIS), who fought the state in the nineties, that undermines any efforts to persuade the younger jihadis to disarm. 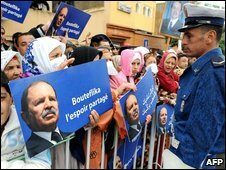 President Bouteflika seems unlikely to make concessions to former political rebels in the near future. With an election win all but assured he is under little pressure to give ground. But critics say it is the security that surrounded the end of the president's re-election campaign that speaks volumes of his failure to fulfil his promises. On the journey to Tizi Ouzou, a hotbed of militant activity in the Kabylie region east of Algiers, there were armed police posted at 100m intervals for the length of the 105km (65 mile) road.